The beautiful Grand Ronde Canyon is one of the West's best steelhead stretches, but there's a little-known fishery that few locals will share. The summer smallmouth fishing is excellent. No one seems to know much about it, except for a few secretive guides and anglers. Guide Rick Hedding is one of them, and together, we recently explored that area. Hedding, who has fished waters from the Colorado River in the southern part of the country all the way north into rivers in southwest Alaska, prefers many of the tributaries found in Oregon and Washington. In fact, he believes that there are no more remote or wilder, scenic canyons than along the Grande Ronde River in the extreme southeast corner of Washington and into Oregon. Mountain peaks in the area range to 4,000 feet. The wilderness river stretch that we floated in Washington is comprised of round rock through a beautiful canyon with cliff walls 1500 to 2500 feet high, and the only way to access those waters is to float through them on a drift boat or raft. That's where most of the river's smallmouth bass are, according to Hedding. 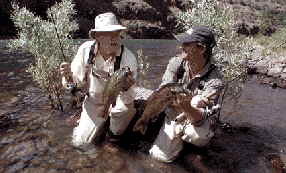 The upper stretches through Oregon are primarily trout waters. While an angler might target the smallies in the section we floated during the summer, you never know what will strike your lure. Plenty of rainbow trout and even a steelhead or two remain in the river, or perhaps a salmon that has lost its way. On our trip, we caught six trout one day in addition to a couple of dozen smallmouth. The Grande Ronde River is the primary drainage for the northeast side of the Blue Mountains, a range that runs from the Cascade Mountains in Oregon down through the Columbia River Gorge. Major tributaries of the 100-mile long Grande Ronde are the Imnaha River and Wallowa River. 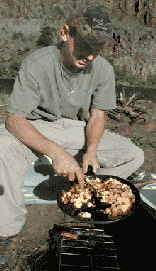 They lie some 20 miles upstream of Boggan's Oasis (or the Highway 129 crossing) where Hedding launches his drift boat. 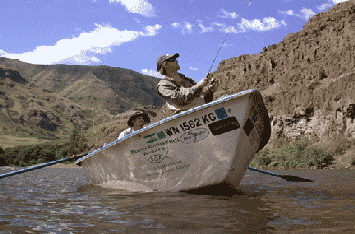 The Grande Ronde as it flows through its canyon areas is designated a "wild and scenic river". Some 30 miles downstream from Boggan's, the river is a major tributary that dumps into the Snake River along the Idaho border below Hell's Canyon Dam. The Lower Grande Dam is the last impoundment on the Snake River before Hell's Canyon Dam, according to the guide. The Grande Ronde River is known for its steelhead fishing and the fish's annual migration or summer/fall run from the Columbia River through the Snake River. In April when spring runoff ends the water temperature will be about 45 or 50 degrees and the river will be high and muddy. On April 15, the fishing closes and then reopens on June 1 each year. On June 1, the water temperature will be around 50 degrees. Around mid-June when the water is in low 60's, the smallmouth become very active and start their run. By July 4th, the water temperature is usually in the mid-70s and stays that way for the summer. It may hit the low 80s, but the average is in the 70s. In September, the temperature will be similar, unless cold weather and rain knock them down. In October when the water temps are in the 60's and when steelhead are migrating up the river, the smallies have mostly moved back to the Snake. We fished the canyon to "Shoemaker Takeout", a section of about 9 river miles. The only bank access is maybe a half-mile or so at the beginning and a mile at the end, so we didn't see a lot of anglers along the way. And that was fine. Below the takeout is another canyon stretching over 20 miles that takes 2 or 3 days to float. Another option is upstream in Oregon where there is another 15 to 20 mile stretch with some whitewater rafting and rainbow trout fishing through a canyon area. There is very little whitewater at most flows, other than in the spring. In June, we had a flow of 4000 cfs (cubic foot per second), but the low water in the fall when rains are scare can see flowage dwindle to 600 cfs. In the "skinny water" of the summer and fall, Hedding is unable to easily skirt the shallow gravel shoals on the inside bends with his drift boat, so he goes right down the canyon walls adjacent the cliff rocks. That makes for some interesting, up -close viewing of the eddies and deepwater pools. The river has lots of gravel bars, which make great spawning grounds. There are ripples and fast water at the tops of the pools and the run the deep holes in the middle of the pool and then the shallows at the tail-out. There are pockets and eddies and biomass that make foam and mats that are great places to fish with poppers. Those are spots they typically fish from the boat as Hedding moves between prime spots. One is of the guide's prime holes in right in front of where he sets up camp on an overnight trip. It is a mid-depth stretch of the river about 5 miles from Boggan's that offers some 600 yards of great smallmouth fishing. Food for the smallmouth is plentiful, since the state hatchery puts thousands of steelhead smolt or 3-inch fingerlings annually in the Grande Ronde. That forage is a lot of protein. In the spring, spawners can weigh 2 to 3 pounds. Every so often, Hedding will get a five-pound smallie, but most are much smaller. The largest smallmouth that Hedding's clients have weighed is a 5.83 pounder, but one pounders are the norm. On one long-light summer day, fishing from dawn to dusk, the guide and two clients caught about 150 fish. 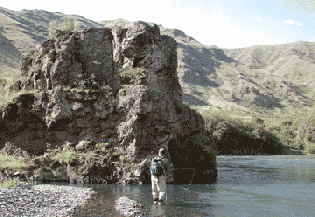 Most of the anglers on the river fish for smallmouth with either flies or ultralight spinning gear, and the average catch may be around 50 fish, unless you get caught up with distractions such as eyeballing the beautiful canyon cliffs or looking at the wild sheep or other animals or bird life. The smallies move up on the Grande Ronde to feed and spawn when the Snake River gets extremely cold, according to Hedding. The smallmouth initially move up in spring when the smolt run occurs, and while they are in the river, they spawn. Then, in the month of October, the water usually gets cold and the smallmouth migrate back up into the Snake.
" The smallmouth pull hard and you can catch them on the surface," says the guide. "They are my second favorite fish after the steelhead. The fact that few people fish here in the summer and those those who do, release most of their fish keeps this place pristine. During the summer, you need to fish with single barbless hooks, which may be a single hook point or a treble. The barb(s) must be pinched down." "The prime thing that I look for, when not admiring the scenery, is falling water for a couple of days," says Hedding. "The water is shrinking. The clarity is increasing and the fish are becoming more active. In lower water, the smallmouth will be more active and want to chase. And less water congregates fish into smaller sections of the river." The 35-year old Hedding has been guiding full time for about 8 years throughout Montana, Idaho, Alaska and Washington. Today, he takes out clients some 130 days per year, mostly on the Grande Ronde River. About 30 of those days will be after smallmouth, and about 23 will be overnight trips. As he states, the canyon is so beautiful and floating it from dawn to dusk makes for such a long day, its better to spend one night on the river. He charges $650 for the 2-day, overnight trip for either 2 or 3 fishermen. His day trip rate is $300 per boat for up to 3 anglers. In addition to his guiding, Hedding also teaches fly fishing classes and gives seminars at outdoor sports shows and Spokane tackle stores. For an unforgettable experience, check out the smallies in the Grande Ronde! Editor's Note: For more information on the river, contact Rick Hedding at the Grande Ronde River Expeditions at 1-509-869-1444 or email him at steelies@comcast.net.